Atriance is a solution for infusion. It contains the active substance nelarabine. Atriance is used to treat patients with T-cell acute lymphoblastic leukaemia (T-ALL) or T-cell lymphoblastic lymphoma (T-LBL). Please call at M: +91 9891296838 / 9811747774 to buy and know more details about the generic FDA approved Generic nelarabine medicine available in India and its cost price. 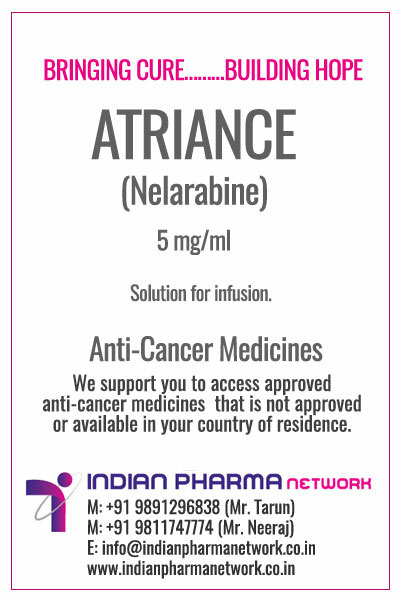 Atriance contains nelarabine which belongs to a group of medicines known as antineoplastic agents, used in chemotherapy to kill some types of cancer cells. Nelarabine is indicated for the treatment of patients with T-cell acute lymphoblastic leukaemia (TALL) and T-cell lymphoblastic lymphoma (T-LBL) whose disease has not responded to or has relapsed following treatment with at least two chemotherapy regimens. Where can I buy Atriance? IPN helps patients, doctors and hospitals as a facilitator to import prescription medicine brand Atriance (nelarabine) Injection on prescription and Import License in Patient's Name only. For procurement of Atriance or nelarabine Injection. Please call at M: +91 9811747774 or Email Us to know more details about the medicine and its cost price in India. For Indian Patients, doctors and hospitals Atriance (nelarabine) Injection can be made available at Mumbai, Kolkata, Hyderabad, Chennai, Ahmedabad, Delhi, Bangalore, Srinagar, Jammu, Jaipur, Chandigarh, Ludhiana, Noida, Gurgaon, lucknow and Pune and other cities in India. The order will be confirmed only after the receipt of valid prescription of doctor and import permit if applicable. Atriance is available as 5 mg/ml solution for infusion. Each ml of solution contains 5 mg of nelarabine. Each vial contains 250 mg of nelarabine..